The Integris CDP is an integrated front-end component intended to serve as the centerpiece of a wide variety of high performance hifi systems. It is, of course, very compatible with the Integris Active 300B but its preamp section is capable of driving a wide range of power amplifiers very well. In short, it is a high resolution CD player and linestage preamplifier intended to compete with the best in available separates in the two-channel audio market. The design goal is to exceed the performance of the finest separates with the operational convenience and value advantages of a single component. Within the Integris CDP, there are numerous state-of-the-art subsystems that deserve attention. We have engineered these subsystems to work optimally and conveniently together to yield outstanding performance and ease of use. 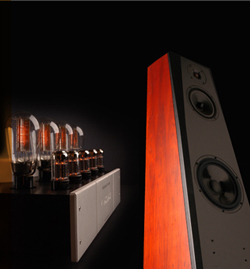 Aurum Acoustics has dared to be different by designing a rare and exciting new audiophile product. The Integris Active 300B provides an elusive blend of vacuum tube beauty and solid-state authority in a high resolution active loudspeaker package. 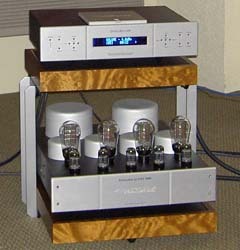 The system includes a pair of crossoverless 3way loudspeakers, a stereo triamplifier, and custom loudspeaker cabling. Although a very sophisticated design, it is remarkably simple to set up and operate. The implementation achieves very high technical accuracy and musical satisfaction that is at the leading edge of high-end audio. Electronic components perform best if vibrations are efficiently kept away or drained away from them. A host of aftermarket racks and accessories are available from many sources but Aurum Acoustics has set out to deliver our own tailor-fitted optimized solution. The Integris rack fits our electronic components like a glove and helps them perform at their best. Each wood framed shelf is ideally matched to the Integris electronics in size and is available in the same veneer finishes as our loudspeakers. The upper shelf is supported by a rigid bolted aluminum exoskeleton. All metal components are finished with brushed and natural or black anodizing to the same spec as our components. Only the Integris Rack can look this good with our system! The Integris Rack features rigid constrained layer shelving. The top surface of each shelf is a “floating” 3mm anodized aluminum plate. Very importantly this is identical material to that used in making our components chassis therefore the capture and flow of vibration is optimized. This plate is fully decoupled from the shelf except through a semi-rigid 40mm damping material that will effectively dissipate all audio frequency vibration entering it from either the component or upward through the rack. A rigid coupling device is necessary between the component and the shelf plate as the vestigial rubber feet fitted on the component will interfere with vibration transmission – only the semi-rigid damping section of the shelf should have absorption capability. At Aurum Acoustics we routinely use and have available the Golden Sound Super ceramic cones. Other similar rigid-style (no soft or flexible types permissible) aftermarket isolation devices may work quite effectively as well. The heavy skeletal frame maintains rigidity of the rack structure which is necessary to allow the damping section to work as the only micro-flexible medium between the mass of each component and the stability of mechanical earth/ground via the floor. The bottom shelf includes an additional set of 13mm thick aluminum members (identical to those available on our loudspeakers) for fastening a trio of cones or other footers. These members maximize the coupling and rigidity between floor and rack. A set of adjustable cones is included with floor protector discs. Two sets of threaded holes (6mm and 0.250”) are provided to accommodate a wider variety of special applications and alternate aftermarket footers. The majority of components are preassembled before packaging. Only the 10mm thick vertical side bars and the cone footers need installation during assembly. All hardware, tools and instructions are included. Assembly time is 30-45 minutes.